Hello Darlings, no morning goes by without us fussing in the mirror trying to get ready for the day. Between the hair and make-up, finding time for breakfast is a challenge on its own and the day has yet to start. Now throw in the holidays into the mix and we’re losing sleep over what to wear and how to style our hair. Being a woman is an absolute gift that comes with its own set of challenges. If I know anything is that at this point in our lives we hope to have mastered the morning routine but getting glam should not feel like a chore but rather an indulgence. It is all a matter of preparing for the season starting with what to wear and how to look. It can all be fun! A large part of my work is attending events, cocktail and dinner parties and with that comes a set of pressures. In particular a set of pressures of how one looks. At least that’s how I always feel when getting ready. After 8 years in the field, I’ve narrowed the routine down to a science and having have researched every shortcut possible. Feeling glamorous this holiday season does not require a pricey trip to a department store but rather a stop at your local Shoppers Drug Mart. Just don't forget to install the Shoppers Drug Mart® app and use the weekly available coupons while collecting Shoppers Optimum® Rewards. So where to start? My mother always said that with beautiful hair a woman can pull off any outfit. It is essentially a crowning glory. I must agree because nothing ruins a perfectly ordinary day or a wonderful outfit like a bad hair day. So after all these years and having have worked with incredibly talented individuals I’ve finally learned what to do with mine. I feel that it is important for every woman to master that one look that she can always fall back on. In my case, I love deep waves. Having red hair requires a lot of maintenance as it’s prone to fading really fast. 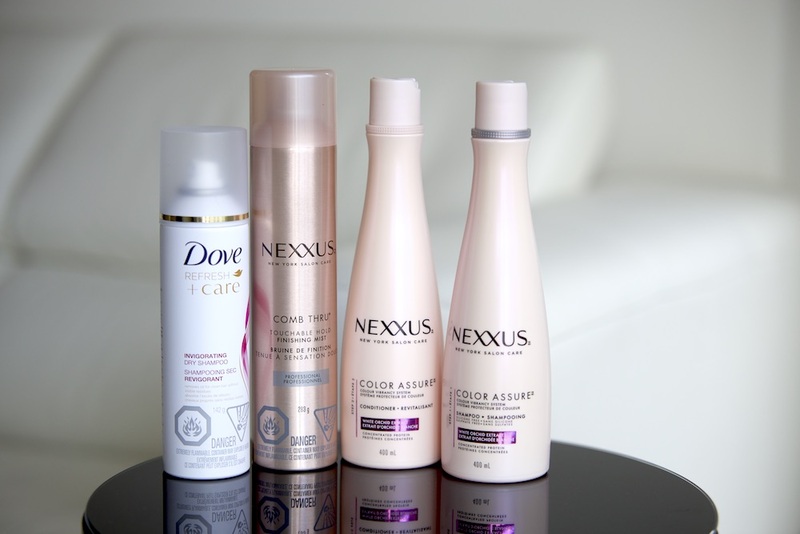 To protect it, I always use products formulated especially for coloured hair, such as Nexxus® Color Assure Shampoo and Conditioner. So a start to every hair do is protecting the colour. While to achieve the classic deep waves l also use hot curlers from Shoppers Drug Mart to save time and also to limit heat damage. To complete any look Nexxus® Comb Thru® Finishing Mist is gentle enough to keep the form while leaving the hair soft to the touch. All of details are coming up in a tutorial video next and for more inspiration check out Holiday To Do list. Now when it comes to picking out a holiday wardrobe it is best to be prepared ahead of time. Personally, I keep an eye out for classic cocktail dresses every time I shop. I really do believe that you never find what you’re looking for last minute. Be on a look out for a classic silhouette that you can dress up or down especially when the sale seasons strike. A little black dress is always a great option as it can be versatile enough to be work with jewelry and stunning pair of heels. Also never forget to show your own wardrobe and try mixing things up. A holiday season isn’t complete without a number of selfies and group pictures. To ensure that you have your perfect post down be sure to practice a little in the mirror. Yes, it sounds silly but nothing ruins a memory faster than an unflattering image. So give it a try and master that one pose that makes you feel like a runway model in the spotlight. *This post was sponsored by Dove, Nexxus, TRESemmé and Shoppers Drug Mart. The opinions expressed herein are those of the author, who is a paid influencer, and are not indicative of the opinions or positions of Dove, Nexxus, TRESemmé and Shoppers Drug Mart.